Angel Meadow – Hell upon Earth! 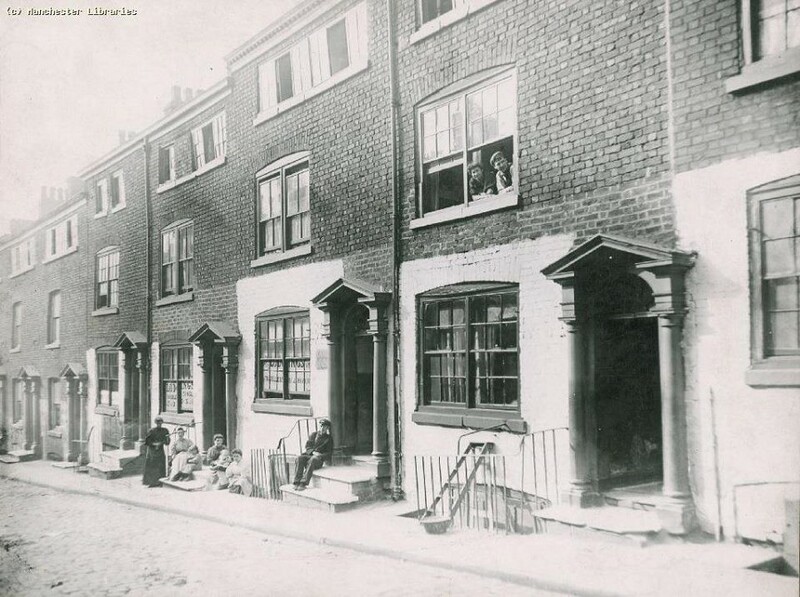 In my novel, The Bowes Inheritance, there is a brief glimpse of life in Angel Meadow, Manchester, where Fenian sympathies ran high and lawlessness prevailed. For the period 1888-1890 the death rate was 50.9 per thousand per annum, while the average for all of England was less than 19. Living in grim conditions, with little space, territorial fighting soon flourished with rival gangs (called Scuttlers) regularly engaging in violence. In an article he wrote for the Manchester Guardian in 1890, Alexander Devine attributed scuttling to four major causes: lack of parental control; lack of discipline in schools; base literature (such as the sensationalist ‘penny dreadful’ novels about pirates and highwaymen) and the monotony of life in Manchester’s slums. The ‘Angels’ gang from Angel Meadow became so notorious that the police would often think twice before entering the area. The gangs gave status, excitement and respect to individuals who had little else. The Scuttlers were easy to spot. They used soap to flatten down their long fringes over the left eye, the so called ‘donkey fringe’ and closely cropped the back and sides of their hair. They often sported peaked caps and silk neckerchiefs. The flaps of their coat pockets were cut into peaks and were buttoned down. They wore bellbottomed trousers, and some had pointed, metal tipped clogs on their feet. The clogs weren’t just a simple fashion statement they could inflict vicious wounds when kicking a rival. Each gang had its own distinctive colours and look. This attention to appearance served a practical purpose. In the heat of battle, it helped distinguish friend from foe. Unlike the gangs of today, the Scuttlers had little interest in robbery or extortion. Their primary purpose was defending their identity by battling other Scuttler gangs in huge brawls, one reputedly numbering 500 people in 1879. They policed their territories and meted out blunt retribution to anyone who crossed them. The gangs flourished up to about 1900 but then slowly died out, mainly due to the clearing out of some of the worst slums. The setting up of Working Lads’ Clubs, the spread of street football and the advent of the cinema are all attributed to getting the young men away from the gangs. The football clubs deliberately targeted the young disaffected youths of Scuttle gang age; one such club was West Gorton, now known as Manchester City FC. For more information on this topic read, The Gangs of Manchester, by Andrew Davies, or take a look at http://www.friends-of-angel-meadow.org.